Writer-director Daniel Lee’s period action epic White Vengeance led a crowded field of new entrants to take the Chinese box office crown last week with a gross of $13.1 million. This was enough to give the China/Hong Kong co-production the 7th best opening week for a non-Hollywood film this year, and the 13th best opening week amongst all films. The rest of the field, which included a total of 7 new films, failed to excite moviegoers. Second place went to another China/Hong Kong co-pro, holdover East Meets West, which took in $3.4 million. Two of the openers were foreign imports: the critically panned Screen Gems action-horror flick Priest, which grossed $3.1 million for DMG, and Terry Gilliam’s France/Canada co-pro fantasy The Imaginarium of Dr. Parnassus, which picked up just $1.2 million for Huaxia. Still, total box office for the top 10 films amounted to $30.6 million, a decent if not spectacular week. 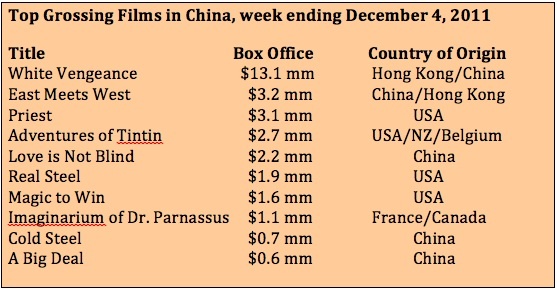 It will take some major hits in the next few weeks for China’s total theatrical revenue to cross the $2 billion mark in 2011, but that’s exactly what might happen, with two big Chinese blockbusters slated to open against each other on December 15th. Tsui Hark’s $35 million action film Flying Swords of Dragon Gate, starring Jet Li, will go up against the $100 million Zhang Yimou-Christian Bale historical epic Flowers of War. The rivalry between the producers of these two films will add some spice to next week’s box office competition. The feisty and outspoken Zhang Weiping, producer of Flowers of War, has banned Bona Group, the producer-distributor of Flying Swords from carrying his film in Bona’s company-owned theaters, claiming that Bona has dragged its feet in paying Zhang monies owed on previous films. Whatever happens, look for box office records to be broken as these two highly anticipated movies kick-off China’s peak holiday season. This entry was posted in Box Office Reports and tagged Bona Film Group, East Meets West, Flowers of War, Flying Swords of Dragon Gate, Rob Cain, Robert Cain, White Vengeance, Zhang Weiping by chinafilmbiz. Bookmark the permalink.